Composites. Preface. Comparison of fracture toughness (GIC) values of polytherimide (PEI) and a carbon-fibre/PEI composite: an experimental and theoretical study (R. Akkerman et al.). Acoustic emission analysis and micro-mechanical interpretation of mode I fracture toughness tests on composite materials (J. Bohse et al.). Delamination behaviour of z-pinned laminates (D.D.R. Cartié, I.K. Partridge). The effect of matrix toughness and loading rate on the mode I interlaminar fracture toughness of glass-fibre/vinyl ester composites (P. Compston et al.). Effect of reinforcement arrangement on destribution of GI, GII and GIII along fronts of circular delamination of orthotropic composite plates (P. Czarnocki). Delamination between multi-directional ply interfaces in carbon-epoxy composites under static and fatigue loading (M.J. Hiley). Bridging law determination in short fibre composites by a DCB-test (J.E. Lindhagen, L.A. Berglund). Mode I fracture toughness of secondary bonds of a novel CFRP hull structure (D. McGeorge, A.W. Vredeveldt). Mixed-mode delamination failure criteria in carbon fibre/composite under quasi-static and cyclic loading (Y. Meziere et al.). Fracture mechanics of composites with residual stresses, traction-loaded cracks, and imperfect interfaces (J.A. Nairn). Intralaminar fracture of weft-knitted carbon fibre reinforced peek (R. Reber et al.). Delamination growth prediction using a finite element approach (P. Robinson et al.). Computational prediction of strain energy release rates of delamination in composite materials (A. Silva, M. de Freitas). Elastic-Plastic Fracture. The influence of morphology and structure on the crack growth of linear polyethylene (H. Beerbaum, W. Grellmann). Numerical simulation of the essentioal fracture work method (X.H. Chen et al.). ESIS TC4 experience with the essential work of fracture method (E.Q. Clutton). A comparative study of thermoplastic films fracture using the J-integral and the essintial work of fracture (L. Cousin-Cornet et al.). Microstuctural and molecular dependence of the work of fracture parameters in semicrystalline and amorphous polymer systems (J. Karger-Kocsis). The measurement of peel strength and the determination of the interfacial work of fracture for flexible laminates (D.R. Moore, J.G. Williams). Low rate fracture toughness of highly filled polypropylene: brittle to ductile behaviour (G. Orange). Adhesion. Peel testing of adhesively bonded joints of carbon reinforced epoxy resin (A. Nick et al.). Interface toughness of joints adhesively bonded metallic plates measured by inproved types of wedge and peel tests (J-Y. Sener et al.). Damage and fracture of wood adhesive bonded joints under shear and opening loading (F. Simon, G. Velentin). An experimental method to determine the complete stress-elongation relation for a structural adhesive layer loaded in peel (U. Stigh, T. Andersson). Effects of constraint on crack tip stress fields and fracture toughness in adhesive joints (C. Yan et al.). Impact and General Fracture. Influence of the morphology on the impact fracture behaviour of iPP/EPR blends (C. Grein et al.). Fast fracture of thermoplastics as a micro-scale tensile drawing process (P.S. Leevers et al.). Further experimental analysis of the dynamic effects occurring in three-point bending fracture testing at moderately high loading rates (1 m/s) and their simulation using an ad hoc mass-spring-dashpot model (A. Pavan, S. Draghi). Effects of rubber content and matrix structure on static and fatigue fracture in ABS copolymers (M. Rink et al.). Thermomechanical couplings and fracture of amorphous polymers (D. Rittel). On the influence of the specimen geometry of DSIF oscillations during an impact test (I.V. Rokach). Strain damage and fracture properties on glass bead filled polypropylene (C.P. Tsui et al.). Dynamics of impact and impact induced fracture of PMMA plate by Lamb Wave analysis (Y. Mizutani et al.). Author Index. Subject Index. This book contains a selection of fully peer-reviewed papers which were presented at the 2nd ESIS TC4 Conference, held in Les Diablerets, Switzerland 13 - 15 September 1999. The meeting was designed to reflect the activities of the Committee over the last 15 years, and to plan future activities. 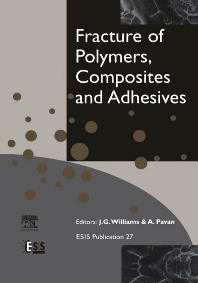 The papers have been divided into four chapters under the headings of Composites, Elastic-Plastic Fracture, Adhesion, and Impact and General Fracture. These are convenient groupings, but there are many interactions between the areas, with the common theme of Fracture Mechanics underlying it all. For researchers with an interest in the fracture mechanics of polymers, composites and adhesives.